Past and present collide in Yu-Gi-Oh! TRADING CARD GAME Cybernetic Horizon, the first 100-card booster set of the 2018-2019 Dueling season! This set modernizes popular themes from the Yu-Gi-Oh! GX, 5D’s, and ZEXAL eras, provides brand-new Link Monsters, and new cards to bolster strategies introduced in Yu-Gi-Oh! TRADING CARD GAME Code of the Duelist, Yu-Gi-Oh! TRADING CARD GAME Circuit Break, Yu-Gi-Oh! TRADING CARD GAME Extreme Force, Yu-Gi-Oh! TRADING CARD GAME Flames of Destruction, Yu-Gi-Oh! TRADING CARD GAME Dark Saviors, and more! Here’s just some of what you have to look forward to! 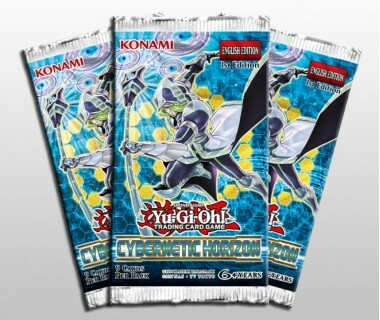 Upgrade your Cyber Dragon Deck for the new era of Dueling! 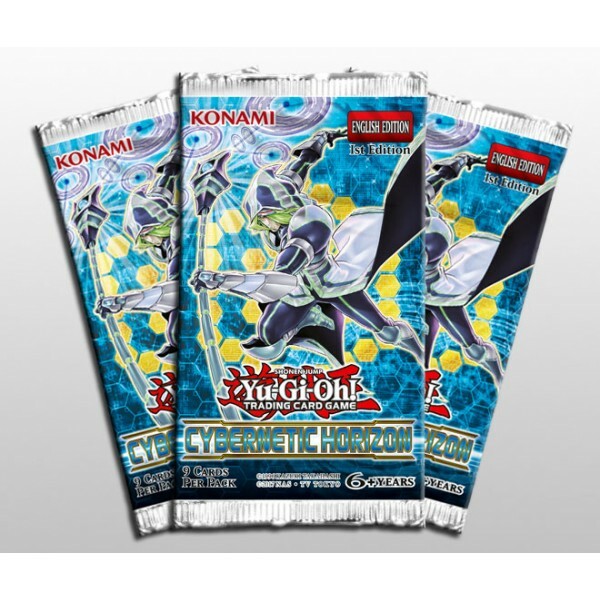 Cyber Dragon returned in last year’s Yu-Gi-Oh! TRADING CARD GAME Legendary Dragon Decks, and Yu-Gi-Oh! TRADING CARD GAME Cybernetic Horizon includes brand-new cards for Cyber Dragon Decks, including a Link Monster that grafts its 2100 ATK on to other Machines! Famous Ritual Monsters return! Demise, King of Armageddon was once the king of competition. Now, new forms of Demise as well as Ruin, Queen of Oblivion tell the tale of these memorable monsters. You’ll also find Cyberse Ritual Monsters, and new cards to help assemble the required components of a Ritual Summon without spending your all-important Normal Summon for the turn! A speck of dust on a camera lens, or a monster hiding in plain sight? Monsters have allegedly walked, swam, and flown among us since the beginning of recorded history, but no one has been able to produce solid evidence of their existence – until now! These monsters lurk in your hand and force your opponent to try and discover them. If they fail, the monster is Summoned to your field and you draw a card! You can also find new cards for strategies like Mekk-Knight, Neo-Spacian, Dragunity, Noble Knight, and more!